Srila Bhakti Pramod Puri Maharaja passed away in Jagannatha Puri last November 22. Puri Maharaja had been the oldest living disciple of Srila Bhaktisiddhanta Sarasvati Thakura, the spiritual master of His Divine Grace A.C. Bhaktivedanta Swami Prabhupada. 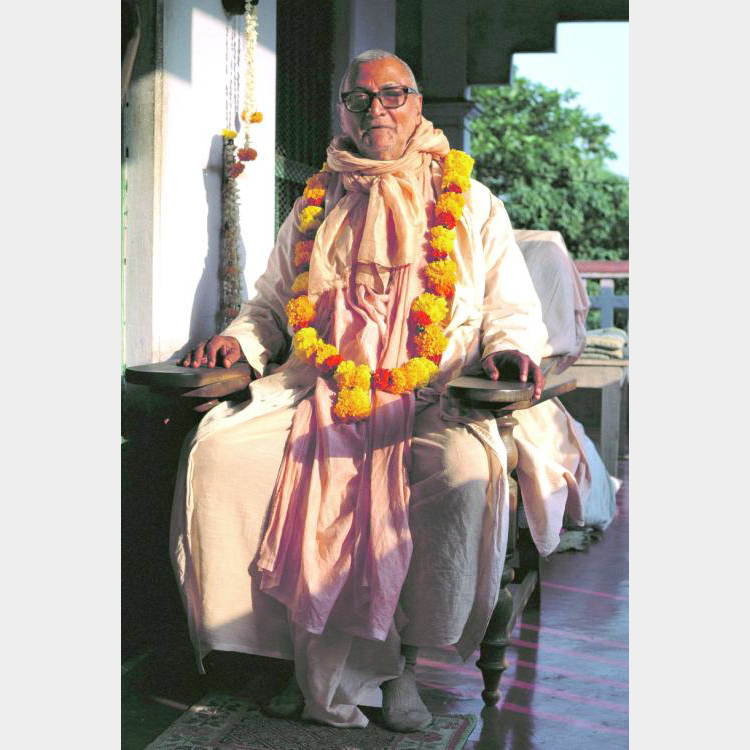 Srila Bhakti Pramod Puri Maharaj Born in 1898 in East Bengal (now Bangladesh), in his youth he encountered the teachings of Srila Bhaktivinoda Thakura (Bhaktisiddhanta Sarasvati's father) and took up Krsna consciousness in the line of Sri Caitanya Mahaprabhu. He met Srila Bhaktisiddhanta Sarasvati in 1915 and received initiation from him in 1923, receiving the name Pranavananda Brahmacari. A college graduate, Pranavananda Brahmacari worked at the Port Commission in Calcutta while living in the ashram of his spiritual master's temple on Ultadanga Junction Road. In 1925 he gave up his job to dedicate himself to his spiritual master's mission. A year later, Srila Bhaktisiddhanta Sarasvati made him co-editor of the Krsna conscious daily paper Nadiya Prakash. After four years he became an editor of Gaudiya magazine. Recognizing his literary talent and knowledge of scriptures, Srila Bhaktisiddhanta Sarasvati awarded him the title Pratna Vidyalankara ("decorated with traditional knowledge"). Pranavananda Brahmacari edited many books published by his spiritual master, including Srimad-Bhagavatam, Sri Caitanya Bhaga-vata, Sri Brahma-samhita, and Sri Caitanya-caritamrta. His service allowed him close and regular association with Srila Bhaktisiddhanta Sarasvati for a number of years. Pranavananda Brahmacari was known for his diligent note-taking, and in later years wrote many articles from the notes he had taken during his spiritual master's lectures. 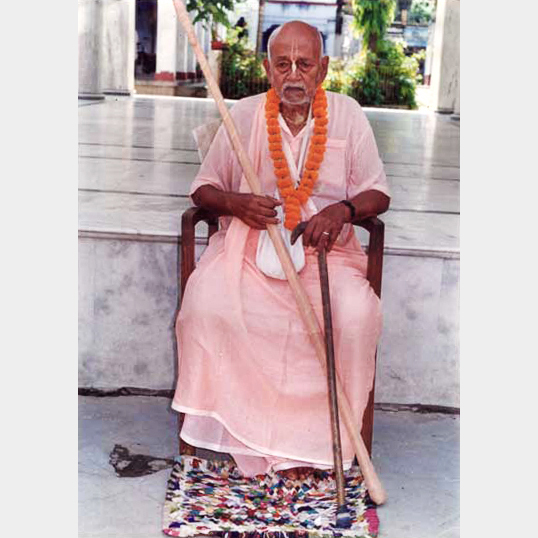 From 1941 to 1947, Pranavananda Brahmacari spread Krsna consciousness throughout Bengal and other parts of India. 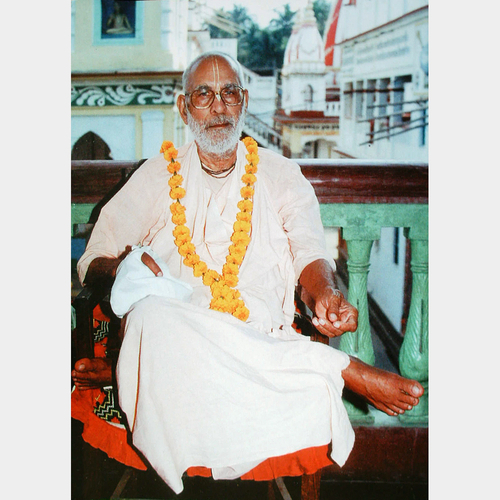 In 1947 he accepted sannyasa, the renounced order of life, and received the name Bhakti Pramod Puri Goswami. In 1954 the royal family of Burdwan (Bengal) gave the temple of Ananta Vasudeva (a form of Krsna) in Kalna to Puri Maharaja, who installed his own Deities, Radha-Gopinatha, alongside Ananta Vasudeva. Puri Maharaja was well known among his godbrothers for his dedication and expertise in Deity worship and would often be called upon to install Deities in his godbrothers' temples. Puri Maharaja took seriously Bhaktisiddhanta Sarasvati's instruction that he never "give up the service of the pen." 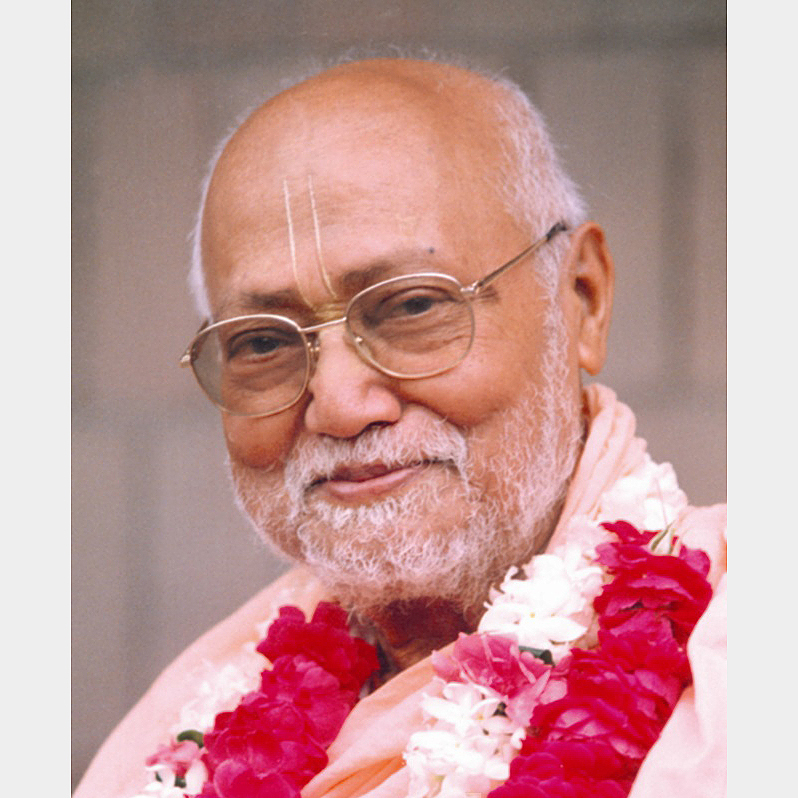 For most of his life he wrote, edited, and published Krsna conscious literature. His disciples have published more than a dozen of his books (written in Bengali), two of which have been translated into English. Puri Maharaja opened temples in Mayapur, Calcutta, Medinipur (Bengal), and Puri. He was given an old temple of Dauji (Lord Balarama) in Vrndavana. His institution is known as Sri Gopinath Gaudiya Math. In recent years, branches have opened in Holland, Panama, Costa Rica, and the United States. Puri Maharaja visited His Divine Grace A.C. Bhaktivedanta Swami Prabhupada shortly before Srila Prabhupada's passing in 1977. 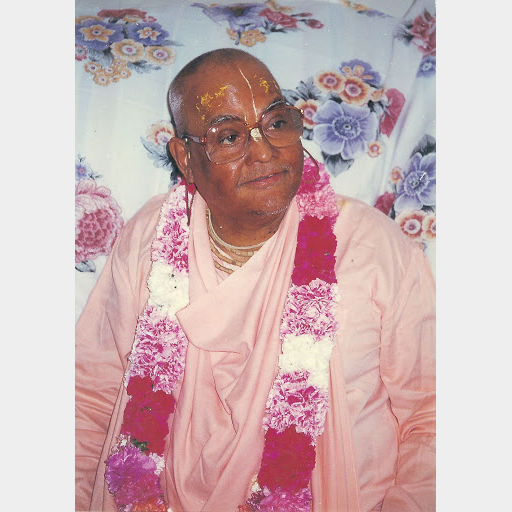 When Prabhupada asked Puri Maharaja to sing, he sang Jaya Radhe, Jaya Krsna, Jaya Vrndavana for Prabhupada's pleasure. Puri Maharaja greatly appreciated Srila Prabhupada service. "His preaching in the West is simply amazing," he once said. When he saw a photo of the Deities at ISKCON's Los Angeles temple, in great emotion he said, "How happy Srila Prabhupada [bhaktisiddhanta Sarasvati] must be!" In 1998 the king of Orissa attended Srila Puri Maharaja's Vyasa Puja (appearance-day celebrations), commemorating Maharaja's one-hundredth birthday. India's prime minister, Sri Atal Bihari Vajpayee, sent a letter of praise and congratulations. Srila Puri Maharaja dedicated his life to Lord Krsna's service. He passed away in the holy land of Jagannatha Puri, surrounded by devotees chanting the holy names of the Lord. His purified body was placed in samadhi (entombed) in Sridham Бхакти Прамод Пури Госвами (в миру Прамода Бхушан Чакравартти) — основатель и руководитель (ачарья) гаудия-вайшнавской религиозной организации «Шри Гопинатх Гаудия Матх». Старший духовный брат Бхактиведанты Свами Прабхупады, основателя Международного общества сознания Кришны (ИСККОН). Имеет несколько сотен учеников вне Индии и много в самой Индии. Родился в октябре 1898 года в деревне Ганганандапур в округе Джессор (Бангладеш), умер 22 ноября 1999 года. После смерти его организацию Гопинатх Гаудия Матх возглавил Бхакти Бибудха Бодхаян Махараджа — его ученик и последователь, который принимает учеников по всему миру. The Legend of Jagannath, Puri is an English documentary aired on Nat Geo. Rajeev Khandelwal takes us to Puri, Odisha to watch the famous Rath Yatra of Lord Jagannath, Lord Balabhadra and Devi Subhadra. With him explore the magnificent architecture of the Jagannath Temple and learn how this yatra brings diverse cultures, faiths and mythology together. Jagannath Rath Yatra at Puri involving moving the deities of Jagannath, Balabhadra and Subhadra to the Gundicha temple, three kilometres away, for a period of seven days. The National Geographic Channel will air tonight an hour-long documentary The Legend of Jagannath showcasing this yatra while bringing to fore the legends and stories connected with the Jagannath temple (one of the char dhams sacred to Hindus), the gods housed in it and the devotional fervour of the faithful. The narrator, Rajiv Khandelwal, a self-declared atheist says, the film helped him understand the faith the people have, their fear of god and beliefs. “Seeing people coming from across the world on a hot and humid day, chanting, dancing, playing instruments and swaying, awaiting for a mere glimpse of the deities and touching the chariot is an amazing experience in itself.” He is right because you can see and feel the deep sense of devotion among the men and women, cutting across all barriers, in their eyes and gestures. Describing himself as an explorer, Rajiv plays the part to the hilt, displaying eagerness to learn while taking the journey of discovery forward. The journey featured in the film is special as it depicts the custom of replacing of old idols of the deities with new ones –– nabakalebra (new body) –– after 19 years, the very first this millennium. 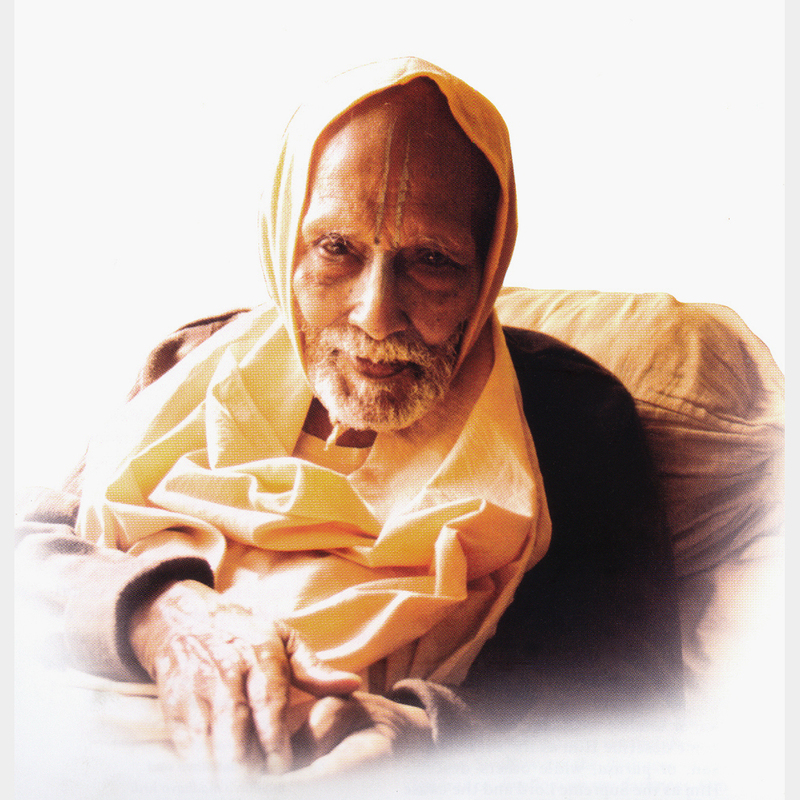 It conveys the message that death is inevitable, says Paramahamsa Prajnanananda, Master Kriya Yoga. “We live with pride, arrogance and stubbornness but here the Lord is saying, ‘I came and I am going. Get ready!’” What makes the documentary interesting is Rajiv showcasing behind-the-scene preparations while providing analysis of unique aspects and nuggets of information. Craftsmen who build the three chariots by shaping the wheels, axle and upper structure and carving intricate motifs rely on handspans for measurement and oral knowledge received from forefathers. Similarly the right of first service to yatra –– sweeping the floor of the chariot –– is vested in the King of Puri. Gajapati Maharaja Dubyasingha Deb, the present king says, “It symbolises that before the Lord there is nothing high or low and even the smallest of our acts should be dedicated at his feet.” Likewise, we gather that the sudarshana atop the temple is not just symbolic but protects the structure from lighting. Nicely woven into film is the legend and history connected with how the god worshipped by tribes became Lord Jagannath (lord of the Universe). Tracing the efforts of a central India king Indradymna in making the tribal god, Nila Madhava, a public deity, this story is shown in pictures making it distinct. Mythologist and author Devdutt Pattanaik’s insightful explanations make the proceedings interesting. Observing that Lord Jagannath belongs to the Vaishnavite tradition, he says, “This deity celebrates life and lives like a king. Getting up in the morning, bathing, wearing different clothes, he is served food.” Believed to visit Puri for lunch, the god is served an array of food items prepared from indigenous ingredients. That is how one of the biggest kitchens in the world came into being. Using 1000 earthen pots just once, 600 cooks prepare 56 dishes on wood-fired traditional stoves which after offering to the god, is distributed as mahaprasad. What is noteworthy is that even though the quantity of food remains the same, there is neither shortage nor wastage irrespective of the number of devotees. The documentary presents a larger than life spectacle in all its colour, customs and culture while emphasising how faith can endure what body cannot. Serial 'Mahabharat' Description: Serial 'Mahabharat' presents the story of the throne of Hastinapur, the kingdom ruled by the Kuru clan where Kauravas and the Pandavas compete for rulership. Both Duryodhan and Yudhisthir claim to be first in line to inherit the throne. When Bhishma asked for Gandhari's hand in marriage for his blind nephew Dhritarashtra, her brother Shakuni got furious. Though he agreed later, he swore to himself that he would destroy the Kuru race. He sowed the seeds of the battle of Kurukshetra during the adolescence of the Kauravas (sons of Dhritarashtra) and Pandavas (nephews of Dhritarashtra) by poisoning the mind of Duryodhan; the eldest Kaurav against the Pandavas. This results in the Kurukshetra war where Shri Krishna imparts "Bhagavat-Gita" (holy scripture of Hinduism) to his Pandav cousin Arjuna. The battle saw the deaths of Bhishma Pitamah, the mighty Karna among many. All the sons of Dhritarashtra and Gandhari died in the war. The Battle produces "conflicts of kinship and friendship, and instances of family loyalty and duty taking precedence over what is just." Cast: Genre: Epic, historical, drama. Directed by: Siddharth Anand Kumar, Amarprith G., S. Chawda, Kamal Monga, Loknath Pandey. Production company: India, Swastik Pictures, 2013-2014. Audio: Russian (MP3, 2 ch, 192 Kbit/s), Hindi (AAC, 2 ch, 192 Kbit/s). Subtitles: Russian, English. Video: MPEG-4 AVC, ~ 2000 Kbit/s, 1280х720, 1920х1080. Container: MP4. Duration: 267 х ~ 00:20:00. Size: 221 GB. Сериал 'Махабхарата' Описание: Сериал 'Махабхарата' рассказывает о соперничестве двух ветвей династии Куру: это Кауравы, сто сыновей царя Дхритараштры, старшим среди которых был Дурьодхана, и Пандавы — пять двоюродных братьев во главе с Юдхиштхирой. Кауравы воплощают в эпосе темное начало. Пандавы — светлое, божественное. Основную нить сюжета составляет соперничество двоюродных братьев за царство и столицу — город Хастинапур. Царём страны становится старший из Пандавов мудрый и благородный Юдхиштхира. Зависть и злоба Кауравов преследуют Пандавов всю жизнь, но с момента провозглашения Юдхиштхиры царём, они достигают предела. Согласно традиции, каждый из присутствующих на церемонии коронации может вызвать будущего царя на поединок; отказ невозможен, он расценивается как проявление слабости. Кауравы, зная, что Юдхиштхира плохой игрок в кости, вызывают его на поединок, и он проигрывает имущество, царство, братьев, жену и самого себя. По требованию деда Кауравов и Пандавов, мудрого Бхишмы, проигранное возвращается Юдхиштхире, но его вторично вызывают на игру, и он опять проигрывает всё. В результате на совете рода было решено: Пандавы и их жена Драупади отправляются в изгнание на 13 лет. Когда в положенный срок Пандавы возвращаются в царский дворец, вероломные Кауравы отказываются соблюдать условия договора, и с этого момента братья начинают готовиться к войне. Армии Пандавов и Кауравов встречаются на поле Куру и сражаются 18 дней. Погибают почти все, лишь Пандавы-победители остаются в живых. Юдхиштхира воцаряется в столице отвоеванного царства, где долго и счастливо правит подданными. В ролях: Жанр: Эпос, исторический, драма. Режиссеры: Сиддхартх Ананд Кумар, Амарпpит Г., С. Чхавда, Камал Монга, Локнатх Пандей. Компания производитель: Индия, Свастик Пикчез, 2013-2014 гг. Аудио: Русский (MP3, 2 ch, 192 Кбит/с), хинди (AAC, 2 ch, 192 Кбит/с). Субтитры: Русские, английские. Видео: MPEG-4 AVC, ~ 2000 Кбит/с, 1280х720, 1920х1080. Контейнер: MP4. Продолжительность: 267 х ~ 00:20:00. Размер: 221 ГБ. Movie - 'Jagat Guru. The Universal Teacher' Description: A documentary on the life and precepts of Srila Bhaktisiddhanta Sarasvati Gosvami Prabhupada. The film includes interviews with acaryas of various Gaudiya missions, interviews with some of the last remaining disciples of Sarasvati Thakura and rare footage and photographs from that time. Language: Russian and English (can be chosen from the title menu). Format: DVD, 4:3. Duration: 1 hour 07 min. (plus extras ~29 min). Фильм - 'Джагат Гуру. Учитель мира' Описание: Документальный фильм о жизни и наставлениях Шрила Бхактисиддханта Сарасвати Госвами Прабхупады. Фильм содержит интервью с ачарьями различных Гаудия миссий, интервью с некоторыми из еще оставшихся учеников Сарасвати Тхакура и редкие кадры и фотографии того времени. Язык: Русский и английский (выбор из основного меню). Формат: DVD, 4:3. Продолжительность: 1 час 07 мин. (плюс дополнительные материалы ~29 мин.). Golden attire (Suna Besha) of Lord Jagannath, July 2007. Прекрасное золотое облачение (Суна Беша) Господа Джаганнатха, июль 2007.